​Volunteer groups can also support Eva's Village by participating in a Mock Job Fair for our Workforce Development Program; undertaking a seasonal landscaping project to beautify our grounds; or by organizing a special collection of food, toiletries, or other items needed by Eva's residents! For more information, contact Angela Vance, 973-825-7215 or Angela.Vance@evasvillage.org. Fund-A-Meal: Invest in Eva's Success! underwrite the daily lunch in our Community Kitchen, helping to support the growing need for our services. Fund-a-Meal Sponsors engage in our mission by forming a team or group of up to 10 volunteers (over age 15) to come to Eva’s and serve lunch on the day of your sponsorship. The volunteer date can be scheduled Monday through Friday; arrival is at 10:00 am and ends at approximately 2:00 pm. 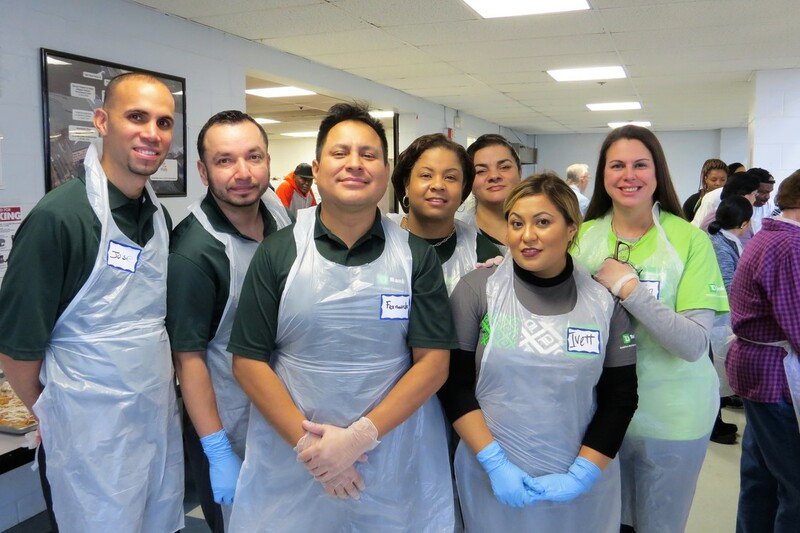 Volunteer teams will enjoy a rewarding community engagement experience, and have the opportunity reflect on the positive impact they made during a roundtable discussion and shared meal with Eva's staff after the volunteer service is complete. A donation of $2,500 underwrites one day of lunch service for 300-400 guests; a contribution of $5,000 underwrites two full days of lunch service for up to 800 guests. Every dollar of your Fund-A-Meal sponsorship goes towards providing meals for individuals in our community who struggle to make ends meet. Recognition in our Voices of the Village newsletter, which reaches 12,000 recipients quarterly, and in our e-newsletter.